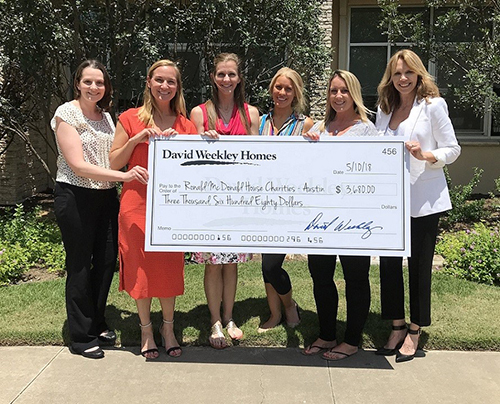 David Weekley Homes team members presented a donation of nearly $3,700 to Ronald McDonald House Charities of Central Texas. Austin, TX (May 17, 2018): The nation’s largest privately-held home builder celebrated more than 40 years of Building Dreams, Enhancing Lives by hosting the third annual David Weekley Homes World’s Largest Showcase of Homes. From April 1-30, more than 8,700 visitors stopped by model or showcase homes across the country to see current innovations in design and décor trends. As part of the company’s charitable and philanthropic efforts, a $5 donation was given to a local nonprofit organization for each visitor who registered with a sales consultant during David Weekley Homes World’s Largest Showcase of Homes, amounting to more than $43,000 for 19 local charities. In Austin, more than $3,600 was donated to Ronald McDonald House Charities of Central Texas. “The Showcase of Homes event is a wonderful opportunity for our entire community, not just David Weekley Homes Team Members, to give back to a cause that is near and dear to many of our hearts,” said Kara Gresslin, sales coach for David Weekley Homes in Austin. For more information about David Weekley Homes in Austin, visit www.davidweekleyhomes.com.